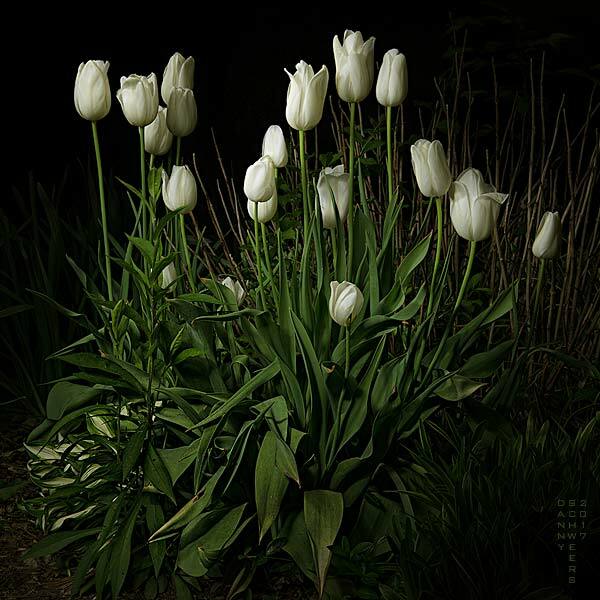 Even at night, the tulips show forth their glory. Even in the dark, they dance and sing. may we do as well as these simple flowers. let it reveal our enduring joy. who escaped the Nazis with her family just before World War Two. Love love love this one Danny! Wouldn't this be a fun thing to try with our photo group? I have a friend who currently is in so need of these words. It's unbelievable how timely your prayer is. My friend is a God-fearing woman who loves the Lord. She is experiencing some emotional pain at this time… I'm certain your words will provide some much needed comfort. Glad you are far more optimistic than I. All there seems to be is darkness coming out of the region south of where you and the lovely Barbara live. I am not very optimistic. My brother shared this with me this morning, and I instantly thought how the tulips and your lighting resemble a painting by one of the old Dutch masters. The words brought me to tears, exhausted as this present world is. Thank you for your beautiful tulips. I always look forward to your photo prayers. This one is particularly elegant and lovely. Thank you for your ministry! So lovely Danny. Your note at the end of the prayer sent me back to view the image and read the prayer again several times. Michael Well done • Barbara Looks like a painting! Beautiful! • Tanya My thought exactly. • Ellyn So lovely.. • Dale Beautiful • Harvey What a great idea using the flashlight. • Casey That is completely beautiful • Thomas Nice job! • Joe Danny! • Linda Wonderful! • Karla Beautiful! • Christine Gorgeous!!! • Sharon very pretty!! • Beverly Lovely • David Ethereal! • Linda They remind me of a postage stamp that came out years ago. A white gardenia on black background. I'll see if I can find the picture. Haunting really. I used them for sympathy cards. Your picture is so much better. • Donna Gorgeous...come to my yard anytime and make even weeds look good with your photography! • Arden Cookie Fabulous! • Sam That's really cool looking • Connie Gorgeous photo. Good eye! • Mark Beauteous! • Jean I love your photo!